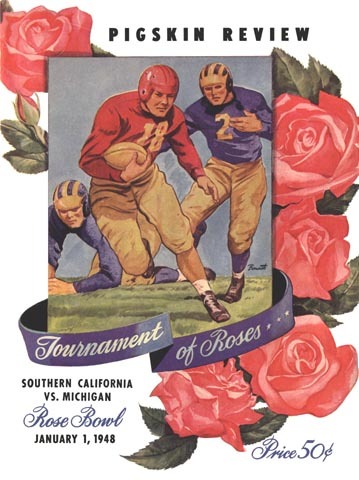 Making their first Rose Bowl (or any Bowl) appearance in 46 years, the Wolverines picked up right where they left off, stomping the previously once-beaten Trojans of Southern California by the same 49-0 score that they'd beaten Stanford by, way back in 1902. This impressed the AP pollsters so much that in an unprecedented move they took a special post-game vote and vaulted Michigan over Notre Dame into the # 1 spot in the rankings. This was never to happen again until nearly 20 years later, when the post-New Year's poll became an annual tradition.